Joe Bonamassa and his band finished up a 23 show tour across the United States and Canada, which came to an end in the Pacific Northwest. There’s a lot of work that goes into getting a convoy of four buses to all these shows, here are some stats for you. 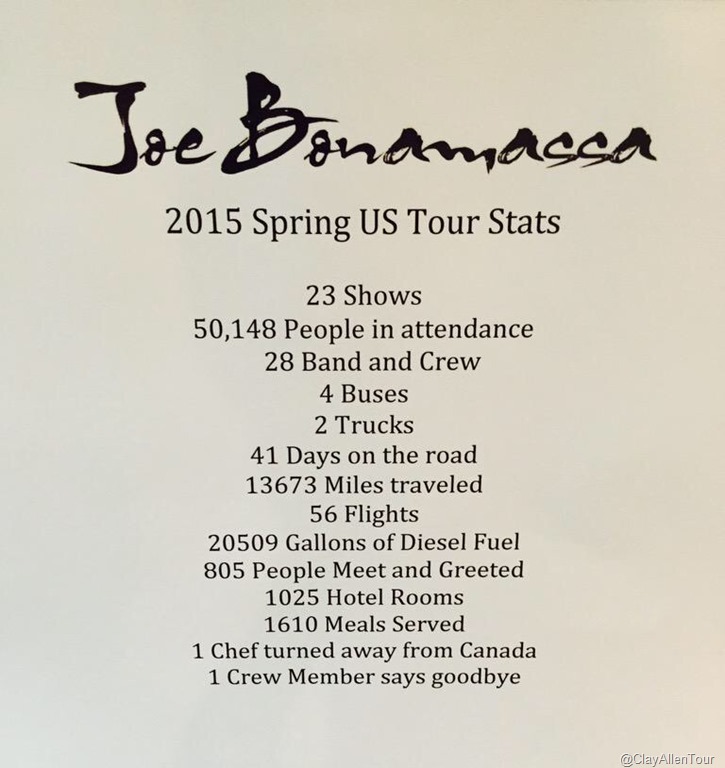 Joe played 23 shows on this tour. At the 23 shows, he played to a total 50,148 fans. That averages out to be roughly about 2,180 fans per show. That’s a huge if you ask me – I remember seeing Joe play for several hundred people at a club 10 years ago. This crazy tour convoy consists of 28 people, which is counting the band and crew combined. On the tour, they traveled 13,673 miles across 41 days on the road and 56 flights. They also used 20,509 gallons of diesel and 1,025 hotel rooms. Joe’s catering crew cooked up 1,610 meals on this tour. By the way, the catering is out of this world! Those are definitely some crazy numbers. It’s easy to see how much hard work and dedication goes into each show. The production is always spot on. From the sounding to the lightning, it always getting better. I always feel that Joe is getting better too and I look forward to seeing him out on the 3 Kings Tour this summer. Don’t forget to check out the dates for that tour, it’s something you won’t want to miss. Thanks @ClayAllenTour for the stats. Make sure you follow him on Twitter if you’re not already!